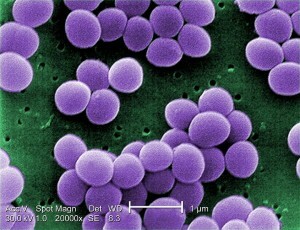 Staphylococcus aureus, primary bacterial agent of Infectious Bovine Mastitis. Bovine mastitis (BM) is an inflammation of the mammary gland (udder) of the cow. It is the most costly disorder in the US dairy industry. BM has a variety of causes including mechanical and chemical injury and infectious disease. The most common causes of BM are bacterial infections with over 17 species of bacteria incriminated in the disease in the US. Bacteria are usually transferred to the mammary gland through contamination of milking machines or hands, although unsanitary living conditions may expose the gland to environmental bacterial agents. Proper sanitation of both milking parlors and living quarters is essential in disease control. Once the bacteria enter the mammary duct and begin to reproduce, they destroy milk-secreting tissue, release toxins which further injure tissue, and elicit inflammatory cells from the blood which ultimately enter the gland. When the inflammatory response is great it causes redness, swelling, and pain in the gland. In that case, the condition is called clinical mastitis. Certain highly toxic strains of bacteria lead to clinical mastitis in a short period of time. Less toxic strains may take longer to reach this stage of inflammation and the infection in these glands –which occurs before redness, swelling or pain is observed– is called subclinical mastitis. The most common method for diagnosis of BM involves counting all the cells found in milk. This is referred to as the somatic cell count (SCC). In clinical mastitis the SCC is often very high (>500,000/ml) and milk containing such high counts is of low quality. Currently subclinical infections are the most serious problem on US dairy farms because they can’t be diagnosed visually and they are associated with lower numbers of inflammatory cells in the milk. In addition, the SCC does not provide information on the duration of illness or the cow’s immune response to the bacterial agent. Inflammatory cells circulate in the blood either continually (awaiting to respond to tissue injury and foreign agents, such as bacteria and toxins) or are produced in the bone marrow in response to infection and released into the blood, which transports them to the site of injury. Together these cells are referred to as leukocytes. During infection, leukocytes are the principal source of somatic cells. At least 8 distinct types of leukocyte cells can be distinguished, based on their function during inflammation. Because the SCC only provides a number, but no cell type is identified, the SCC neither provides the count nor the relative percentage of each cell type. These distinct types of cells may be identified by proteins uniquely found on their surface or by their cellular morphology (size and shape). Understanding the sequence of their appearance in milk and how long they remain during the course of infection is key to proper diagnosis of BM especially subclinical cases. Mastatix has conducted the only longitudinal-experimental studies on record on this topic. This knowledge has served as the basis for our patented algorithm. Once the disease is diagnosed, the producer may initiate antibiotic therapy or cull the animal from the herd, with the resulting loss of revenue. Animals under therapy must have their milk isolated and discarded, again resulting in a loss of revenue. Because many subclinical cases can remain undiagnosed, the consequence is lower milk production and a further loss of income. Today, in the US, it is estimated that dairy farmers lose between 1.7-2 billion dollars per year due to BM.